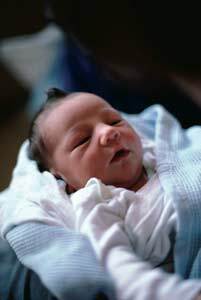 Bouts of persistent crying occur in all newborns from time to time, and for a variety of reasons. Babies who have regular bouts of intense crying, however, may be diagnosed with colic. Colic is defined as continual or persistent crying without any apparent reason. It usually begins at around 2 or 3 weeks of age, and subsides on its own by 12 weeks. Babies with colic have prolonged bouts of intense, high-pitched crying. Some infants draw their legs up and clench their fists, as if in pain. Babies with colic may be inconsolable; nothing their parents do seems to soothe them. In spite of persistent crying, these babies do not have any apparent symptoms of illness. Parents of a colicky baby may be relieved to find out that, however alarming the bouts of crying are, colic itself is not a serious condition. Though they may appear to be in distress, babies with colic are usually in good health. A baby who has regular bouts of persistent crying should be examined by a pediatrician to rule out any possible medical problems, and to confirm that the baby's health and development are normal. There is no cure for colic at the present. Fortunately colic disappears on its own, usually by about 3 months of age. However, there are ways in which you may be able to minimize bouts of colic. Burping your baby during and after feedings may help relieve gas, and minimize bouts of colic. As well, using baby bottles designed to reduce air intake may be helpful for bottle-fed babies. Breastfeeding mothers may find it helps to avoid foods such as broccoli and cauliflower if they seem to cause gas in their babies. Finally, keeping a calm environment may help minimize colic in some babies.